The Hawaii Department of Transportation recently wrapped up a nearly one-month effort to install “gateway in-street” sign treatments at four intersections along Pali Highway in Nuuanu as part of a pilot project to determine if they’ll help protect pedestrians in “non-signalized” crosswalks. 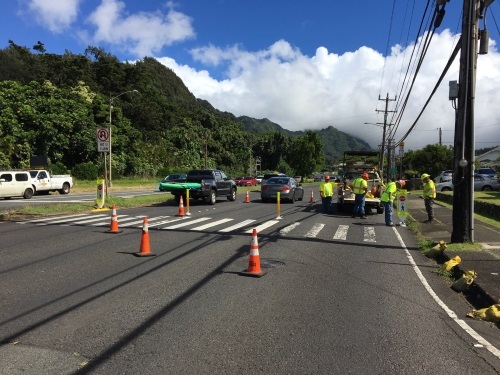 Gateway in-street treatments are two signs posted on either side of the road, accompanied with yellow delineators in between each travel lane to draw attention to the crosswalk, noted Ed Sniffen, Hawaii DOT’s deputy director for highways, in a Nov. 27 blog post. “We’ve made a commitment to prioritize safety on our highways and that includes looking at solutions that can bring safety to our roads sooner,” he said, adding that similar treatments installed at crosswalks in Michigan were shown to increase vehicles yielding to pedestrians. The agency noted that Hawaii suffered a total of 104 traffic-related fatalities through Nov. 21 this year, of which 37 were pedestrians. Hawaii DOT added that more gateway in-street sign treatments will be installed at four non-signalized intersections on Farrington Highway in Waianae in December this year, which will be “assessed for effectiveness” to determine additional locations in the future for installing more of them.